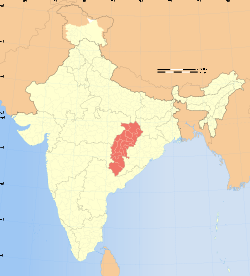 Chhattisgarhi (Devanagari: छत्तीसगढ़ी) is a language spoken in the Indian state of Chhattisgarh, by 13 million people. It is an Eastern Hindi language with heavy vocabulary and linguistic features from Munda and Dravidian languages. Chhattisgarhi is also known as Dakshin Kosali and Kosali as in ancient time Chhattisgarh was known as Dakshin Kosal. Chhattisgarhi has been known by the name Khaltahi to surrounding hill-people and by the name Laria to speakers in neighboring regions of Odisha to Chhattisgarh. The speakers are concentrated in the Indian state of Chhattisgarh and in adjacent areas of Madhya Pradesh, Odisha, and Jharkhand. Chhattisgarhi cultural and political movements, with origins going back to the 1920s, affirmed Chhattisgarhi linguistic and cultural identity and sought greater autonomy within India. This came about in 2000 when 16 districts of the state of Madhya Pradesh became the new state of Chhattisgarh. Chhattisgarhi is most closely related to other Kosali group of languages known as Bagheli and Awadhi (Avadhi), and these languages are classified in the East Central Zone of the Indo-Aryan languages or Kosali Language Group, the Indian branch of the Indo-European language family. Its precise relationship to Hindi is complex and as with other members of the Hindustani dialect continuum, its status as a dialect or separate language is to some degree a judgment call. According to the Indian Government, Chhattisgarhi is an eastern dialect of Hindi, but it is classified as a separate language in Ethnologue. In addition to Chhattisgarhi Proper, the dialects of Chhattisgarhi are Baighani, Bhulia, Binjhwari, Kalanga, Kavardi, Khairagarhi, Sadri Korwa, and Surgujia. Surgujia is considered by some to be a distinct language. Chhattisgarhi, like Hindi, is written using the Devanagari script. After the formation of the new state, films in Chhattisgarhi language attracted artists from all over the India. World-renowned singer Lata Mangeshkar and others also sang Chhattisgarhi songs. G. A. Zograph: Languages of South Asia, 1960 (translated by G.L. Campbell, 1982), Routledge, London. ↑ Hammarström, Harald; Forkel, Robert; Haspelmath, Martin; Bank, Sebastian, eds. (2016). "Chhattisgarhi". Glottolog 2.7. Jena: Max Planck Institute for the Science of Human History. ↑ Pathak, Dewangan, Rijuka, Somesh. "Natural Language Chhattis garhi: A Literature Survey" (PDF). International Journal of Engineering Trends and Technology (IJETT) – Volume 1 2 N umber 2 - Jun 2014. Retrieved 21 March 2015. ↑ Subodh Kapoor (2002). The Indian Encyclopaedia: La Behmen-Maheya. Cosmo Publications. pp. 4220–. ISBN 978-81-7755-271-3. ↑ Subodh Kapoor (2002). The Indian Encyclopaedia: India (Central Provinces)-Indology. Cosmo Publications. pp. 3432–. ISBN 978-81-7755-268-3. C. K. Chandrakar, "Chhattisgarhi Shabadkosh"
C. K. Chandrakar, "Manak Chhattisgarhi Vyakaran"
C. K. Chandrakar, "Chhattisgarhi Muhawara Kosh"
Chhattisgarh Rajbhasha Aayog, "Prashashnik Shabdkosh Voll. I & II"
.gurturgoth.com webpage on Chhattisgarhi language by Sanjeeva Tiwari, Durg.